Three of the best athletes of the country and the “Nazaré Qualifica” brand signed a sports sponsorship deal, on Monday last, August 31, which aims at promoting the potential of the waves of the county’s beaches for the practice of sports waves. 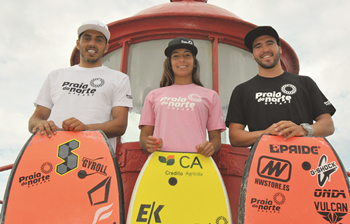 Teresa Almeida, ISA World Champion; Tó Cardoso, n.10 World Ranking APB, and Dino Carmo, with several titles of National Champion, are from the beginning of this week, sponsored by the “Praia do Norte” brand. The international dissemination of Nazaré, where he will perform tests of the sport in which they participate, and the encouragement of high competition of the county athletes are some of the purposes of this cooperation. This sports sponsorship deal with the three athletes trained in Nazaré comes a few days the holding of the 5th Round of the World Bodyboard Circuit in Praia Norte (September 29 to October 4), for which the world’s best athletes are expected , practitioners and spectators of the sport and waves sports. Source: Região da Nazaré jornal.